I am retired from civil service, my husband is still working civil service however, is retired navy. We live on Bennett's Creek in Suffolk, Virginia where we plan to retire. We LOVE our dogs and cat. 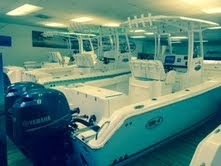 The new boat is ice blue. Our previous boat was named nauti dog. We prefer something along Ones of animals, dogs, our river, retirement or the amount of money invested in boat.... Love humor! We are soul mates, very happily married! Got any ideas? Please comment with your boat name suggestions for this happy couple!